i think the most painful day was the Barbados test of 1997. Last day of 10th Board exams. Dodda Ganesh and Kuruvilla had ripped through Windies in the 2nd innings leaving a paltry target of 120 to chase and win a test (which was als the series decider) on foreign soil after years. Perfect vacation gift for us people. And what does India do? And I remeber the magical 10 wkt spell from Kumble. I was giving some Karla Shukla exam (12th std) on a sunday afternoon and the supervisors were discussing no of wickets by kumble. They kept saying 2,4, 8 and then by the time I finished it was all 10!!! Another one against Pak is of course the Sehwag triple century, fabulous!!! 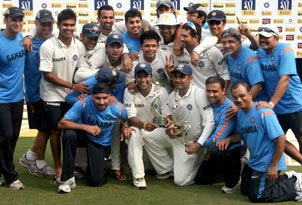 I remember that day too.. Congrats to the Indian Cricket team on being No.1 in the world. Thats quite an accomplishment. You and your team have proved me wrong! !